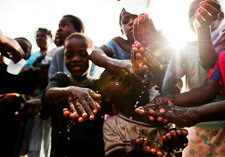 Samaritan's Purse works with communities to install and rehabilitate hand-dug wells and boreholes. After a project is completed, we offer maintenance training to community members who will assume responsibility for upkeep. Health and hygiene education is one of the best ways to reduce illness. We conduct workshops that focus on personal hygiene, hand washing with soap, food preparation, household sanitation, and proper waste disposal. 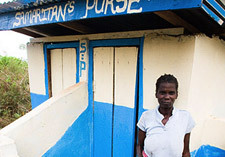 Properly built latrines greatly reduce the spread of waterborne disease and prevent diarrhea, one of the leading causes of death among children. Capping natural springs and protecting rainwater catchments ensures that a community will have a consistent source of clean water. 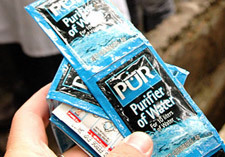 These packets are often used in emergency situations, when large populations have been displaced and have immediate water needs. 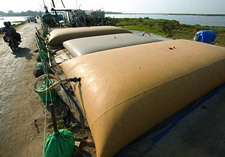 The powdered mixture contained in each packet removes harmful microorganisms and suspended matter, making water clean and eliminating waterborne disease. 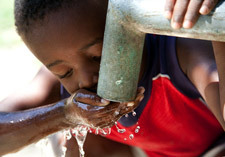 In emergency settings, unclean water is pumped through this device, which uses several filters and a small amount of chlorine to kill bacteria. 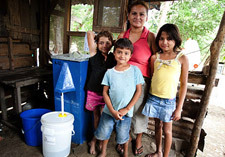 One system can purify up to 10,000 gallons per day, enough to provide for the daily needs of 2,500 people. 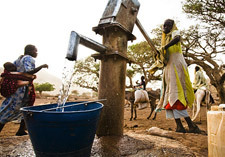 Your gift for clean water can provide tanks, filters, latrines, hygiene training, and other essential measures to protect water sources and prevent the spread of disease as we seek to meet physical and spiritual needs in the Name of Jesus.